The Way Of Jesus is not a path only for individual spiritual salvation. The Way is an entirely new order, by which the nations of the earth are transformed. Violence, control and avarice are the old order. The one we call High King demonstrated his authority by reversing it all, laying down his privileges and power for the sake of others. Hundreds of years before Isaiah wrote this book of hope in the midst of disaster, the people of God were rescued from slavery out of Egypt by the hand of God. From Mount Sinai, God gave his law to Israel, calling them a nation of priests, called to be ambassadors to the world of the love and freedom and justice of the God who had liberated them. God promised to give them a land, from which they would be a light to the entire world, an example in their just community of the just God they worshiped. God gave them the law, which described their just society, and included in it that they should never, ever return to the land of Egypt, or ever trade with this violent empire from which they had been freed. God kept his promise, and in that land, Israel began to build for themselves a beautiful city filled with great wealth. In Isaiah, God describes their treasure not as his blessing to them, but as evidence of their corruption. In Isaiah 33, God says that these horses and chariots, the war machines of ancient empire, had come from Egypt. Indeed, 1 Kings 10:28, 2 Chronicles 9:8 and 2 Chronicles 1:16 all confirm that during the reign of King Solomon, Israel entered into trade with Egypt to build their army. As soon as God’s people had established themselves in the land, they forgot their liberation from Egypt, and instead turned to Egypt to make their new nation in its image. At the beginning of Isaiah, the once powerful nation of Israel finds themselves among ruins. They have been attacked, destroyed, and scattered among the empires of the North. Only a few remain in their own land. In the midst of this chaos, God promises that though he has judged them for their oppression, for seeking to become an empire rather than trusting him, he will bring them back to their land, and redeem them for his original purpose. God’s people would be a light of justice and love in the world again. Jesus fulfilled perfectly everything that the law and the temple and the sacrifices were to represent. He carried in himself the complete history and identity of God's covenant people. He obeyed the law of God. He became the sacrifice for all sin by his death on the cross. He is the temple of God, in whom the fullness of the Godhead dwells. As the perfect incarnation of perfect justice and steadfast love, he submitted himself to the worst of the spirit of the old order, the way of empire, going to a violent death so that all of that old way may be consumed and die with him. By Christ's exaltation, all the violence and greed of the empire has been exposed and overturned. All that once came between humanity and God has been transcended. All false walls between persons and people groups may now be demolished. All are one who are united in Christ, the just judge who willingly takes the punishment on behalf of the guilty accused. We are each set free to walk the same path. By that freedom, the slavery of hierarchy, violence, greed, and corruption is defeated, and the world is transformed by the seed of Christ into the garden of God. Isaiah identifies four distinct realms of human power that God will overturn. 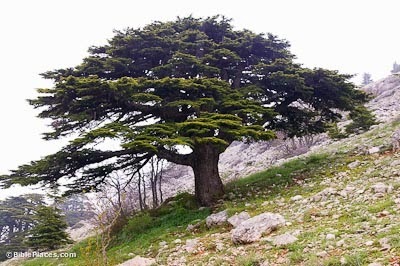 Cedars of Lebanon were old and majestic trees. They took a very long time to grow, and were examples of strength, rootedness, and ancient beauty. To bring cedars and oaks low likely means to disrupt the nation’s feeling of stability in their own length of days. Mountains in the Bible and especially in the prophetic books represent authority, law, and government. High towers and walls were built around the city for protection, and were guarded by the army. God will bring low the military might of the nation. The nation’s trade was done by ship, and the craft of the city is an example of some of the most valuable of the nation’s traded goods. National pride, governmental authority and law, the military, and commerce – everything that a nation looks to for its strength and identity – will be brought low by God because of the corruption, injustice, and violence toward the poor and vulnerable. God is the source of all goodness and prosperity and life. God warns those who live as though they are their own god that because of their arrogance, the presence of God be removed from them. Without the source of life, all that the prideful believed they had accomplished will be lost. All they believed they had gained by their own merit will decay. Outside of the blessing of God, none can prosper. We have nothing of our own of which we can boast. We must acknowledge God in all things. The peace promised in Isaiah 2 does not come by policies and governments. It is neither reform nor revolution. The old way is entirely dead. The kingdom will come by the power of resurrection. It is the new humanity in the new Creation on the new earth. The power of the resurrected Christ is the grace to live as God’s people now, shining light in the dark, inviting all those who still live in darkness to come home. We will pound weapons into gardening tools, living in radical resistance to the old way, planting gardens of life in beautiful communities of love all over the ruined landscape, celebrating the living city of God as we watch it daily overgrow the corrupt governments of the empires of the world. Recommended: Isaiah 1 - To Hell With Religion. We Need Justice.